This week’s Photo of the Week is a re-visiting of the same original image that formed the starting point for the mono-chrome conversion that was Photo of the Week 48. Although I really like the black & white version, the only reason it exists is that I was never happy with the original colour shot. It was lacking that ever so hard to define something that makes photos ‘pop’. The initial photo was taken on St. Patrick’s Day 2008 – so about a year and a half ago. Since then I’ve become a hell of a lot more practised at post-processing, so, this evening I had another go at processing this shot, this time keeping it in colour. After some tweaking of the blue channel and some selective contrast adjustments with Aperture’s Dodge & Burn plugin I’m now happy enough with the shot to use it as a Photo of the week. I guess the lesson here is never to be afraid to go back and re-edit your old images. I fell in love with this shot the moment I saw it importing into iPhoto. I’m not even sure it’s technically a good photo, but I just love it. 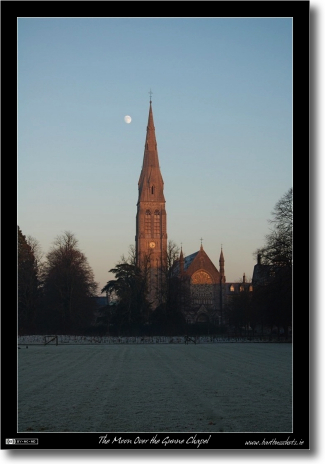 I took this shot from St. Mary’s Square on the grounds of St. Patrick’s College (AKA the NUI Maynooth South Campus). For those of you who’ve visited the campus, that’s the square with the cool water garden in it next to the College chapel. I’ve always loved the architecture of the buildings around this square, and in particular these little sun-roofs. You have these little sunroofs on both St. Mary’s and St. Patrick’s House, but these ones are on St. Patrick’s House. It was quite hard to get this shot without getting a wet foot, but I eventually managed to line everything up correctly and get the shot, even if I was at quite a stretch. As a friend of mine put it on Flickr, this photo combines my three nerdy hobbies, Astronomy, Photography, and trains. 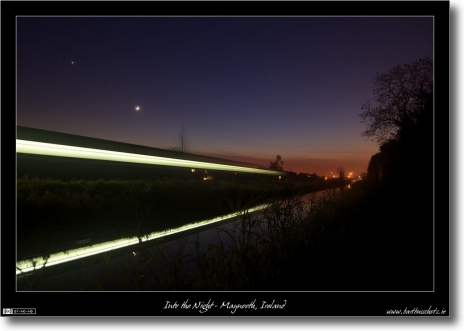 This is a 5 second exposure of a commuter train approaching Maynooth reflected in the waters of the Royal Canal in the late evening while Venus & the Moon shine over-head. This is a shot I’d tried before, and each time I learned a few more valuable lessons. So, although this is the result of a learning experience, I’m still shocked at how lucky I was to get everything to line up as well as it did. The train, the reflection, the silhouette of the tree, those things I could control, but the positions of the Moon and Venus, those were a pure bonus! Anyhow, if I had to pick my three best photos yet, this is one I’d definitely choose. 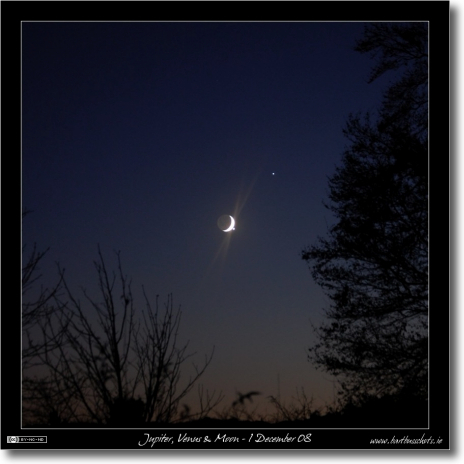 Last Monday (1 December 2008), the Moon, Jupiter & Venus were in a very close conjunction in the sky. For the non-astronomers amongst you that just means they were very closely placed in the sky. In fact, they were so close that Venus actually passed behind the Moon! This week’s photo of the week if my favourite shot of the event, you can see the rest of my shots in this Flickr Set. 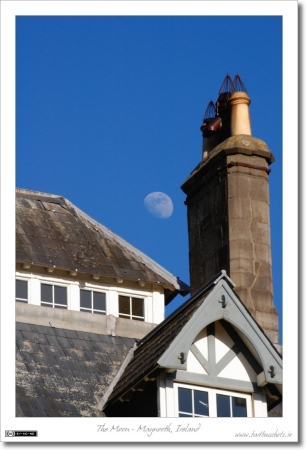 This week’s photo of the week was taken not long after Venus re-appeared from behind the Moon. You can see it just off to the right of the think crescent Moon. Jupiter is the bright point of light above and to the right of the Moon. I took this shot back in December last year as the sun was setting after work. This shot was taken as a very special time of the day, when you can expose both the landscape and the Moon correctly in a single exposure. 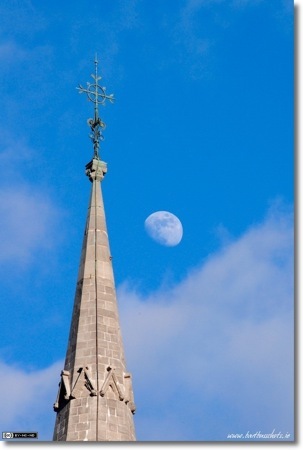 The shot shows the Moon over the Gunne Chapel (AKA the College Chapel) on the campus of St. Patrick’s College in Maynooth, Ireland. 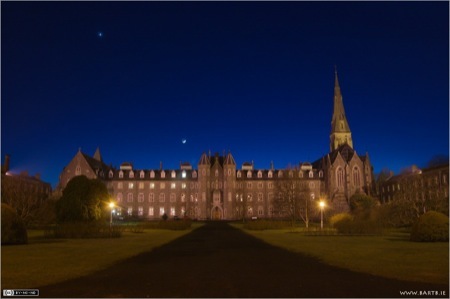 This campus is also shared with NUI Maynooth. Although planning and preparation are very important in photography, some of the best shots are still happy coincidences. This is the perfect example of such a shot. I thought I’d figured out the exact shot I wanted so I was making my way to the spot I’d chosen very carefully when I glint of reflected moonlight hit my eye. I stopped my bike immediately and managed to get this shot after a few attempts. 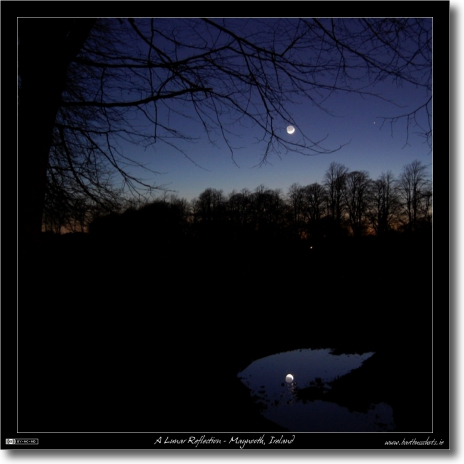 I took this shot not long after sunset on an evening early last month from the edge of the playing fields on the campus of St. Patrick’s College in Maynooth, Ireland. 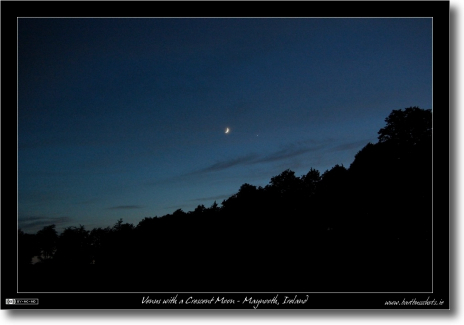 This photo was taken on the evening of the 18th of June 2007 on the playing fields on the South Campus of NUI Maynooth. The playing fields are large open grass areas for sport surrounded by wonderful old trees. This photo was taken just as twilight was ending when the Moon and Venus were very close together in the sky.